The VID Fire-Kill Model APS – KIP is a system utilizing very small open watermist nozzles designed specifically for the protection of attics and other such large rooms with sloped ceilings. The system is a deluge system and is designed to cover floors underneath sloped ceilings up to 140 degrees. The system is designed to cover up to 6,5m horizontally to both sides from the installation point using only 7 bar water pressure. 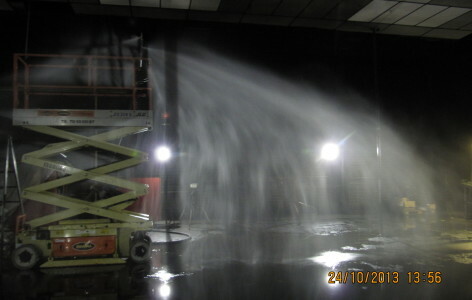 The design saves cost on system pipes and fittings, as well as the installation cost itself. The Model APS – KIP is successfully tested to DFL test method standard TM70111-04 and TM90810-01, both soon to be a part of CEN/EN 14972 (European watermist standard). 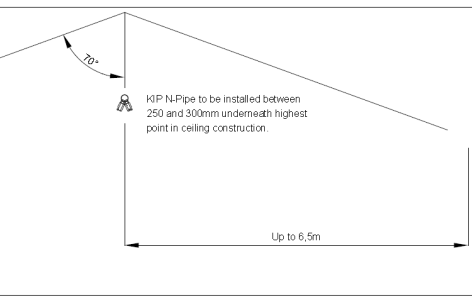 The Model APS-KIP is designed to cover non-storage ceiling attics up to 13m width and 5m height (at highest point) per single line pipe installation where the main fire risk is the attic structure itself such as wood beams and combustible ceiling material. Such attics are typically found in cultural heritage buildings.